Okay, back to the dinner, we started with the Montadito Con Atún y Jamon. Sitting atop crunchy bread, there was a generous portion of soft tuna mixed with picada, artichoke and Serrano ham finished with a piparra. Creamy and mildly salty from the Serrano ham, there were occasional interruptions from the sweet little bits and hits of acidity. The side salad was vibrant and crisp, yet far too salty. 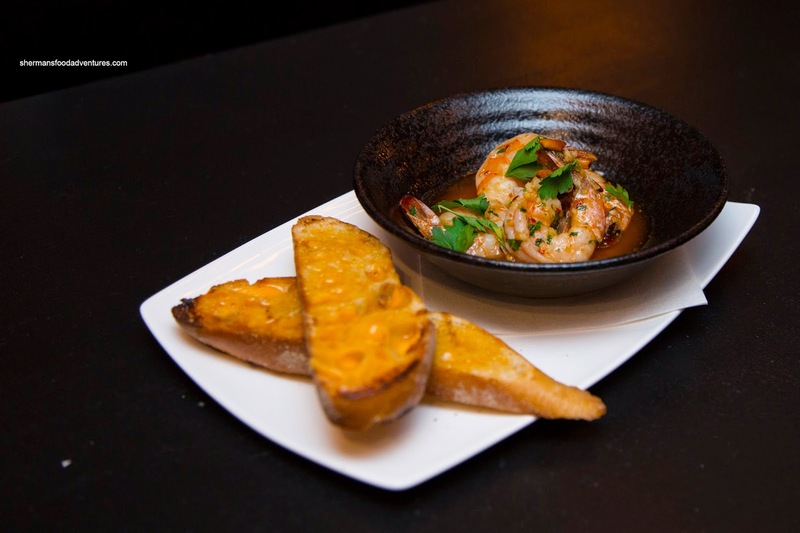 Next up, we had the Gambas al Ajillo consisting of prawns, chili, white wine, almonds, garlic, parsley and prawn toast. The nicely-sized prawns exhibited a natural essence while finishing off with a meaty snap. Although there was an appealing combination of sweet, salty and spicy with a touch of acidity, the saltiness was more dominant. I really liked the side of crunchy toast topped with a prawn-infused aioli despite being rather greasy. 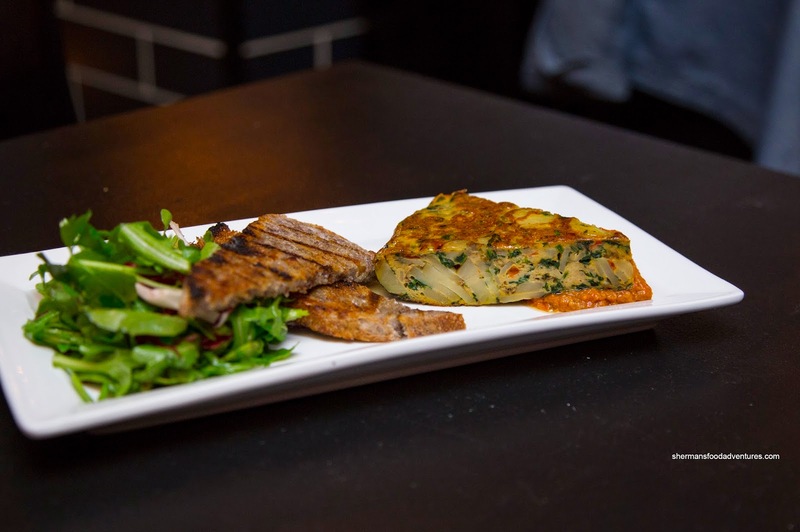 Onto our next dish, we had the Tortilla con Manchego consisting of free-run eggs, Manchego cheese, Romesco sauce, roasted pepper, spinach, fingerling potatoes and walnut bread. I found the soft layered potatoes to be appealing in texture, however, the Manchego was curiously in the background. Offsetting the mild flavours, the Romesco provided an aromatic hit of nuttiness and punch of olives. The best part of the dish was the crunchy and nutty walnut bread. 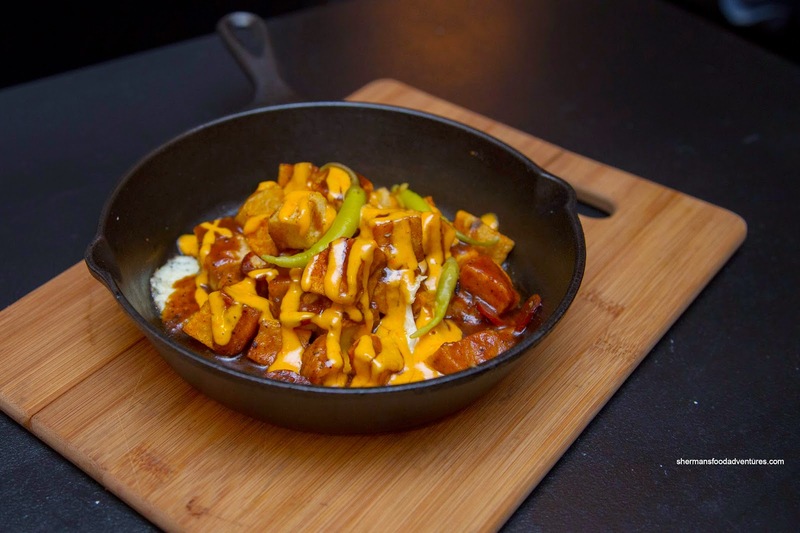 In somewhat of a surprise, our favourite dish of the meal was their entry into the Poutine Challenge, being the Poutine de la Bravas (a take on the classic Patatas Bravas) with smoked chorizo, charred tomato gravy, pepper aioli and cheese curds. Slightly crispy, the tender chunks of potatoes were caressed by a spicy aioli and rich smoky gravy. The melted cheese curds formed a tasty crust on the bottom of the cast iron pan. Spicy and meaty, the chorizo added body to the dish. 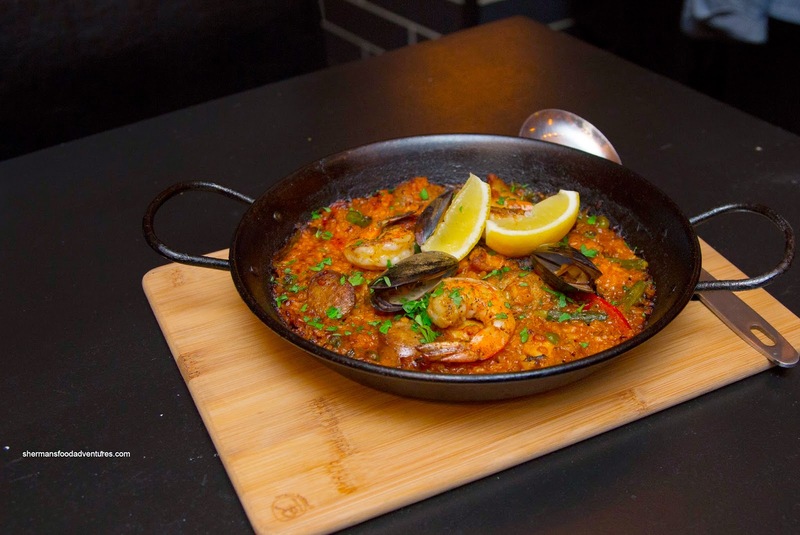 Lastly, we shared the Paella Tradicional Valenciana made with arborio rice, saffron, mussels, white tiger prawns, sausage and chicken. Since this was a smaller portion, the thin layer of rice was not texturally consistent. There was somewhat of a crust on the outside edges, yet overall, the rice was pretty wet. Although not as briny as I would've liked, the aromatic saffron really came through. The small amount of seafood was cooked properly with buttery mussels and meaty prawns. 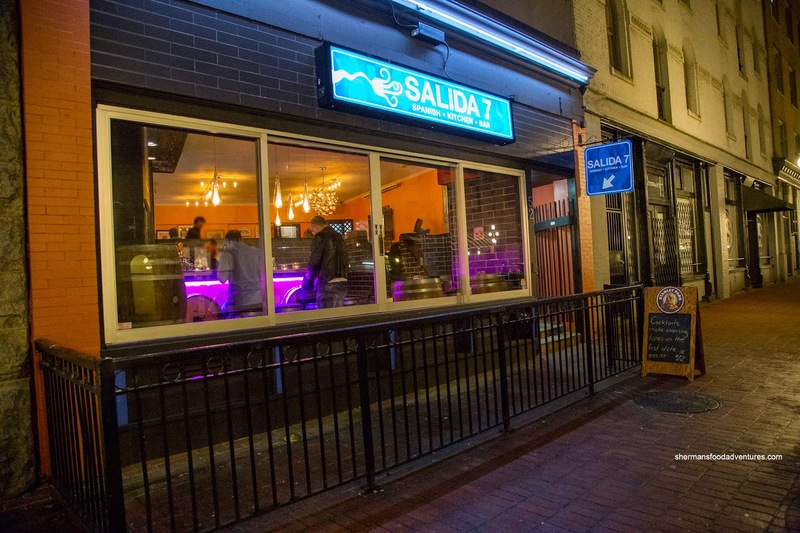 Overall, our meal at Salida 7 was pleasant enough. 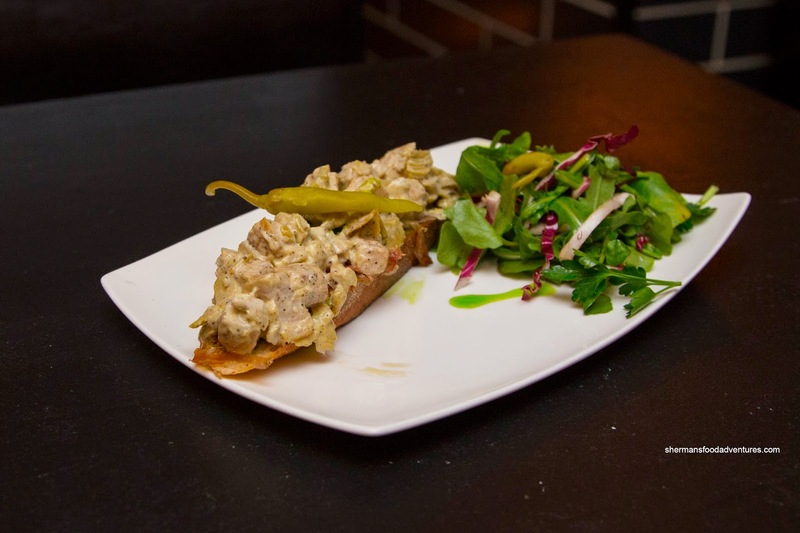 With the lack of Spanish tapas in town, Salida 7 does the job. Prices are on the higher side though.